Maldon and District Community Voluntary Service (M&DCVS), Heybridge Parish Council and Heybridge Co-operative Academy are launching a Green Gym initiative linking with Active Maldon. The gym sessions will make use of existing outdoor equipment at Heybridge Academy, The Street, Heybridge, CM9 4NB. 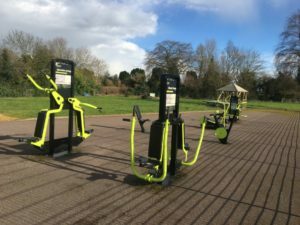 Use of the Green Gym aims to provide people with a way to enhance their fitness and health and is ideal for those who would not normally attend a conventional gym or sports centre. Green Gym is viewed by participants as being beneficial to mental health and wellbeing and those who attend regular sessions may also show improvement in cardiovascular fitness, muscular strength and mental health. The launch will take place on Monday 8th April from 10.30 am – 11.30 am and there will be another session on the following Monday 15th April. After the two initial sessions the Green Gym will open on Saturdays between 10.30 am – 11.30 am from the 27th April.